On Mickey's Not So Scary Halloween Party Board I suggested you set up a Mickey O'Lantern station for the younger kids. Today I wanted to show you my version of a Mickey O'Lantern. I chose to go with a traditional black Mickey Icon, but you could use orange to make it more a pumpkin like jack o'lantern or reverse the black and white here for a Jack Skellington feel. I also suggest having other craft supplies available for the kids such a glitter, markers and chalk for the kids to really make the Mickey O'Lanterns with their own flair - don't forget to add some bows or witches hats for a Minnie O'Lantern. First I cut out my Mickey Icon, you can use the one from the MNSSHP post or if you own a Silhouette you can create your own by using the circle tool like I did here. (If you would like for me to send you the cut file I created just send an email). The eyes here are from the Silhouette Studio - eyes item #32843 & mouth #32838. There are several other eyes and mouths to choose from, I would keep the number of different designs to a minimum so you don't overwhelm the kids. If you don't have a Silhouette here's a link to some great stencils from Craft Buds. 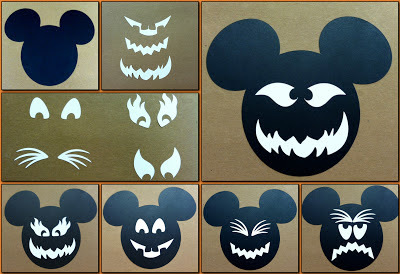 If you have a Xyron sticker maker just run the eyes and mouths through it after they are cut, it makes it super easy for the kids to put their Mickey O'Lanterns together. If you don't have the Xyron just use an Elmer's glue stick. I hope I have inspired you to make some Mickey O'Lanterns with your little ones. Be sure to let me know if you do, I would love to see pictures!! Beth you really do, they have specials on crafters blogs all the time. The next time a see one I will let you know. I am new to your blog and came across this. Two of my favorites Mickey and Halloween!! !